We have a two page color palette, as well as the matching docker palette that you can load into CorelDRAW, Photoshop, or Illustrator. It will dock on the right side of your screen next to the default palette or your swatches. You will need to print and sublimate the palette onto a hard and soft substrate if you plan on working with both types of material. We suggest White Aluminum for the Hard Substrate, and a White Vapor Shirt for the soft substrate. 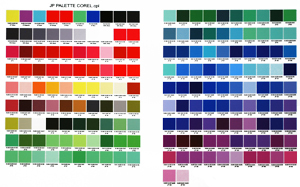 Once you have sublimated your color palette, you'll need to determine which color(s) you want to work with. You will now be able to choose your text or piece of your vector graphic, and click onto the corresponding color on your docker palette. When you print your file, with the same driver and settings as your color palette pages, it will have your chosen colors. If you are a user of Adobe products such as Photoshop or Illustrator, we have the same color palette in an EPS format. You can match colors the same way in these programs.